With nothing new to report for week 22, I’ll get straight on with week 23. This saw one new snack called Mississippi BBQ Pistachios. 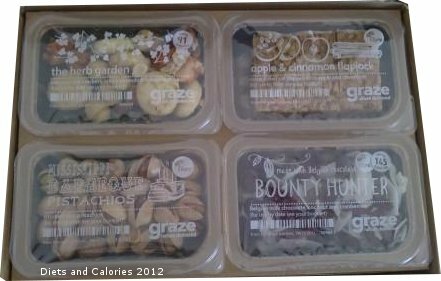 Also in the Graze box were three favourites ‘Apple and Cinnamon flapjacks’ reviewed in week 5, ‘The Herb Garden’ reviewed in week 7, and ‘Bounty Hunter’ reviewed in week 2. 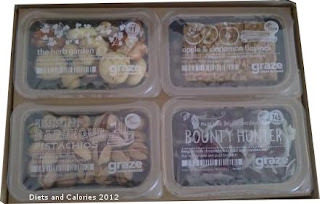 Onto Week 24, the Graze delivery box for 11th May. 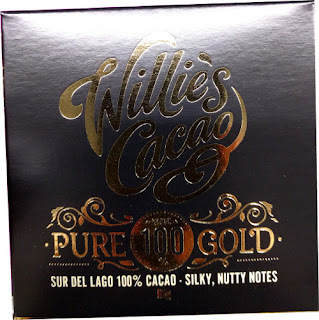 Inside were two previous favourites: ‘Jaffa Cake’, (roasted hazelnuts, orange infused sultanas and dark chocolate buttons) reviewed in week 16 and ‘Rock the Casbah’, (walnuts, dates and pumpkin seeds), reviewed in week 3. Herb Garden, Apple & Cinnamon flapjacks, BBQ Pistachios, Bounty Hunter. 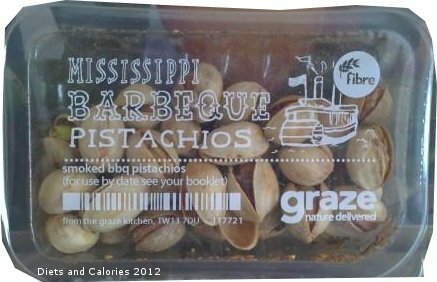 This little Graze nibble snack contains a handful of pistachios still in their shells. These were quite a contrast to the chilli & lime pistachios received a few weeks ago. Most of them were easy enough to prise open and some had fallen out of their shells. One or two required the help of a sharp knife, but it was well worth the effort. Their delicious, lightly smoked barbecue flavour made them a tasty and satisfying afternoon snack. This small punnet of nuts contains 185 calories, so is one of the higher calorie snacks. 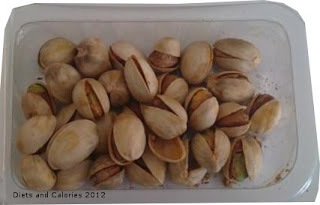 But because they’re in their shells, they do take longer to eat as you can’t just grab a handful in one go. 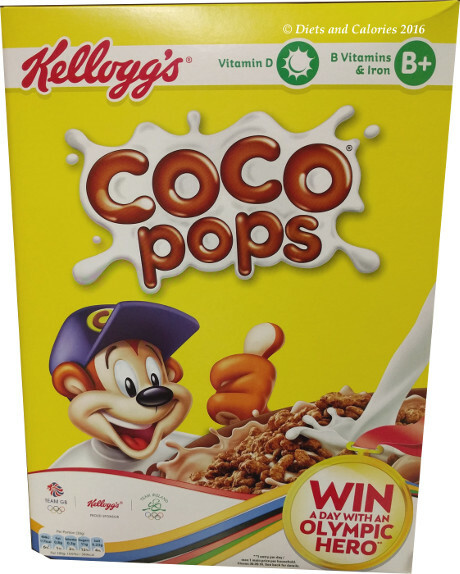 And according to the nutrition booklet, they’re a good source of fibre, which is good for filling you up. These were totally delicious. I want more.. (LOVE). Calories for the punnet: 185. Rock the Casbah, Jaffa Cake, Crunchini Basilico, Eleanor's Apple Crumble. This snack is a mix of dried apple, sultanas, almonds, cinnamon, honey and sugar. I love apple crumble but rarely eat it because of the calories. Of course this snack isn’t really an apple crumble, but Graze cleverly assemble healthy ingredients to mimic the real thing. Just looking at the nuts meant I couldn't wait to rip the lid off this one and dive in. The dried apple was chewy, a little sponge like and generally what you’d expect of a dried apple. The sultanas were nice enough, not infused with any flavours though. As expected those almonds were to die for. All crunchy with a gorgeous honey and cinnamon sticky coating. Sadly there weren’t too many of them and they were the first to be eaten from the punnet. I think the idea is you should take one of each ingredient and eat them together to get the apple crumble taste, and this does work well. Of course, mixing just a few of the higher calorie ingredients into the punnet is what keeps the calories lower and the Graze people work out how to get a good balance of nutrients in each snack. I’m giving this snack a LIKE rating as I love the nuts but not crazy about the apple. Calories for the punnet: 115. 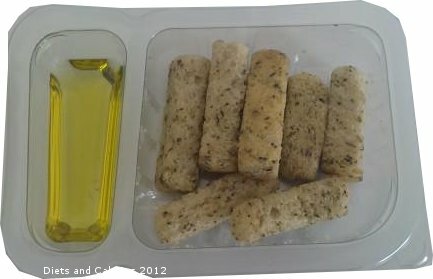 This is a new snack in the Graze range which consists of a few crunchy bread sticks (baked herb crunchinis) accompanied by a small portion of basil infused oil. When I first saw this snack, I almost recoiled. I know you are meant to dip the breadsticks into the flavoured oil, but after a lifetime of avoiding oil at all costs (apart from a daily omega 3 supplement), eating neat oil this way wouldn't be easy. However, with the whole punnet worth just 80 calories, I thought this a good chance to see what I've been missing out on. Anyway, after peeling back the lid, the delicious smell of basil was just too tempting. Biting into a dry crunchini first off, was a noisy experience. The crunchinis are hard and exceptionally crunchy. The sound of myself crunching filled my head and blocked out all other sound! Maybe it needed a bit of oil. The next one was duly dipped into the oil and sampled. Mmmm, delicious. The oil enhances the herbed crunchinis with its basil flavour, but does nothing to soften them or lessen the racket made by crunching. Passing them around, it was the same with everyone, all agreeing they are exceptionally noisy and very crunchy. 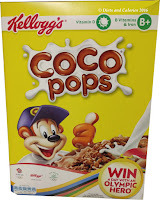 Despite that, they taste gorgeous, and with only 80 calories I definitely want these again. They get a rating of LOVE. Calories for the punnet: 80. 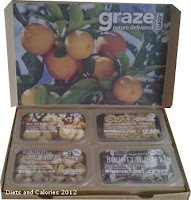 This week’s Graze nutrition booklet asks ‘What do grazers have in common with paleolithic man?’ Inside it explains that the Graze nutritionists often like to pretend they’re Paleo men, because the foods our hunter-gatherer ancestors used to eat were high in fibre, antioxidants, vitamins and omega oils… just like a graze box. If you’d like to receive a Graze box completely free of charge, simply visit the Graze website and enter this code: 9HZTPXFD when you’ve selected the nibbles you’d like to try. Your Graze box will be delivered on a day that’s convenient for you. If you’re happy, you can carry on receiving more snacks, or if not, there’s no obligation to have any more after the first sample. You’ve got nothing to lose!